(Inside Science) -- Soccer fans around the world are gearing up for the 2018 FIFA World Cup, which is set to kick off in Russia next week. New storylines abound, from whether Egypt's rising star Mohamad Salah can return from injury, to Iceland's first appearance. But some old storylines remain -- such as criticism of the tournament's new official ball. Some players have already complained about the ball, dubbed the Telstar 18, which debuted in international play last November. "It's really strange," Spanish goalkeeper David de Gea told the Spanish website AS this spring. "Goalkeepers are going to have a lot of problems with this ball," said Pepe de Reina, his teammate and fellow goalkeeper. The complaints evoke the controversy that swirled around the Jabulani, the much-maligned ball used in the 2010 World Cup in South Africa. That ball was widely panned for its unpredictable and unstable path through the air. Adidas' 2014 follow-up, the Brazuca, generally received positive reviews and little criticism. Despite the initial complaints, a new study shows this year's Telstar 18 should fare just as well. "This year's ball is not going to be spectacularly different from the one before," said John Eric Goff, a physicist at the University of Lynchburg in Virginia. Using wind-tunnel experiments, Goff, along with Sungchan Hong and Takeshi Asai at the University of Tsukuba in Japan, found that the ball's aerodynamic properties are similar to that of the Brazuca. They recently reported their results in the Journal of Sports Engineering and Technology. "We're in for a good World Cup," Goff said. Yet controversy has often surrounded the World Cup ball. In the first World Cup final in 1930, Argentina and Uruguay squabbled over which ball to use. So they played with Argentina's preferred ball in the first half and Uruguay's choice in the second. Adidas has been designing the official ball since 1970, when the original Telstar debuted. The ball was the first with the black-and-white pattern of 32 hexagons and pentagons that's now become iconic. That general design persisted until 2006, when the Teamgeist ball featured a new 14-panel pattern. In 2010, the panel count fell to eight with the Jabulani. "Every time you reduce the panel number, you're reducing the percentage of the ball where there are seams," Goff explained. With fewer seams, the ball is smoother -- which also makes its movement through the air more unpredictable. When a soccer ball is kicked at high speeds, a thin layer of air hugs the ball. As the air flows toward the back of the ball, it creates chaotic, turbulent eddies swirling behind. But as wind resistance slows the ball, its speed drops and the airflow changes. The flow becomes what's called laminar. It's smoother, and instead of hugging the ball, the air separates from the ball at the sides, creating a larger wake. The wake, it turns out, exerts a drag force on the ball, and the speed plummets even more. The smoother the ball, the lower the speed at which this sudden slowdown happens. In a 2014 study, the researchers found that the Jabulani's transition speed was around 54 mph -- a speed typical of corner kicks and free kicks. A kicked ball would start off above this transition speed. But as air resistance slows the ball down, the airflow goes from turbulent to laminar, the drag shoots up and the ball's speed drops. This abrupt, midair slowdown can flummox players. "Had I seen that wind-tunnel data before the  World Cup, I would've been screaming at Adidas, 'Don't use this ball,'" Goff said. 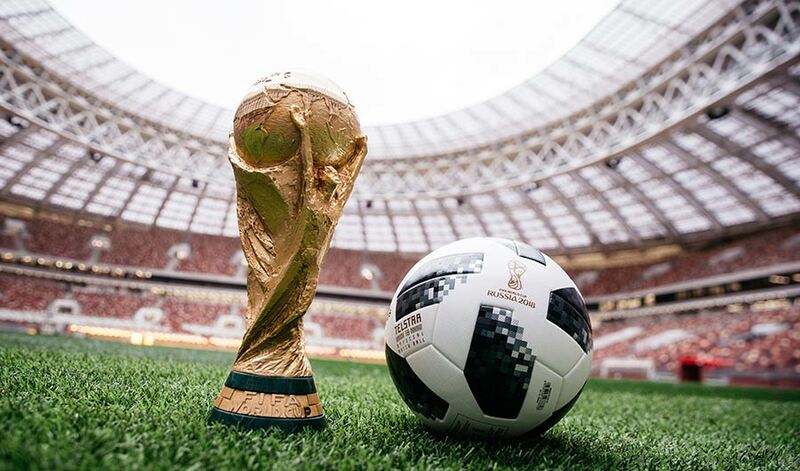 Although the Brazuca has only six panels -- two fewer than the Jabulani -- each panel has a unique shape that resembles helicopter blades, giving it 68 percent longer seams than the Jabulani. The researchers found that tiny bumps on the panels add to the overall roughness and lowered the transition speed to about 38 mph. That's slow enough that most balls never reached the transition and never experienced the sudden deceleration due to drag. In the new experiments, the researchers measured the airflow around a stationary Telstar 18. Although it also has six panels, it has 30 percent more seams than the Brazuca. To counter the extra roughness due to the new ball's longer seams, designers made the seams shallower and reduced the bumpy texture of the panels. The result is a similar aerodynamic response. The biggest difference the researchers found is that for long-range kicks, the Telstar 18 will travel 9 to 10 percent shorter in distance than the Brazuca. One thing wind-tunnel experiments with a stationary ball don't address is the elastic property of the ball -- essentially, how squishy it is -- said John Bush, an applied mathematician at the Massachusetts Institute of Technology. A squishier ball has more give upon impact. It can then make more contact with your foot, allowing you to exert more torque and spin to bend the ball's trajectory around defenders. The researchers plan to do similar tests with spinning balls. Still, Goff said, the nonspinning experiments reveal the fundamental aerodynamic properties of the ball and allow the researchers to calculate how the ball would travel through the air. And on the pitch, no one should be surprised at what they see either. "It should be business as usual at the World Cup," Bush said. "There shouldn't be any squawks about the new ball. But on the other hand, there always are, so we'll see what happens."